Well hello, there beautiful people! Last month Wardah Beauty from Indonesia come to Malaysia. As you know Wardah Beauty is famous halal beauty line from Indonesia and now they are available in Malaysia exclusively in Watsons. They were here in Malaysia to launch their new skincare line that was developed more than 7 years! It's the new White Secret Range. Last month, we get to mingle together to learn about this skincare range and we all we up to the 30 days challenge where we will use all these essential skincare from White Secret for 30 days. I am excited to show you guys on the result and my thoughts on it. But first, let me show ore about White Secret range and explain and show you each product that I tried in this line. How it works? Wardah White Secret Range has an innovative formula that wors specifically to slow down skin pigmentation process and gives your skin a healthy & brighter skin. It also helps skin to increase its elasticity and gives skin a crystal clear skin. I will give you my thoughts on each product I tried in this range. These products were used for 30 days and at the end of this post, you will see the result & my verdict. Always start with cleansing your face! It is the key to a better absorption of your skincare routine. After removing my makeup using my usual makeup remover. I will cleanse my face using this facial cleanser. This is a soft & gentle face cleanser. It does not lather that much but it still gives my skin feeling fresh and cleanse without any tight dry feeling or overly greased. This cleanser is formulated with AHA. What is AHA? AHA stands for Alpha hydroxy acid. This ingredient helps to remove dead skin cells that have been a layer or blocking your skin. A perfectly well-cleansed skin can help your other skincare absorb well. This cleanser also helps to remove light makeup. I practice double cleansing, 1st cleansing is the makeup removing routine, then the cleanser. This helps to remove any left out makeup I have on my face to ensure my skin is well cleansed. It helps my skin to feel better and more refreshed. I love how it has a fresh and non-overpowering scent to it. Second, it toning up your skin! Start with something light like a toner or essence. This treatment essence is such a major love to me! This is the Wardah White Secret Pure Treatment Essence. It is formulated with Silver Vine Extract, Niacinamide and Skin Awakening System. It has a light watery texture that instantly absorbs into the skin. You can apply it using your hand with gently patting motion or use a cotton pad by wiping it upwards. It leaves my skin feel supple and soft. A serum is next! The serum can be used during night time only or if you like layering skincare on every routine to get that boost, go on. 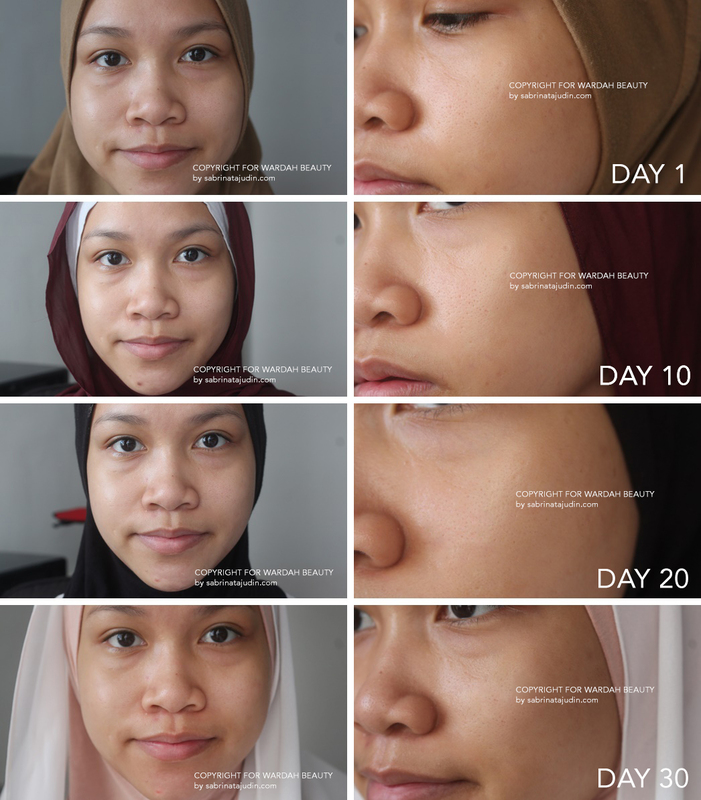 I also love applying serum during day and night. A lightweight with intense treatment is a plus for me. This Wardah White Secret Intense Brightening Treatment serum may look small, but it has amazing benefits to the skin. This serum helps to reduce dark spot, brighten skin and even out skin tone. The texture is very gel like to my opinion. But does not have any sticky feeling. The frosting of the skincare routine. Creams <3. During the day, I will use the day cream. This day cream has 35SPF PA +++ sun protection. It has a white texture cream, a little goes a long way. This cream helps to protect your skin from UVA & UVB. It is formulated with Crystal White Active that helps accelerates the brightening process. During the night I will use the night cream. It has a gel to a creamy light texture that feels like a sleeping mask. Intense hydration and protect my skin from drying even in air conditioning room. During sleep time this helps to prevent melanin production. During night time, did you know that your skin regeneration activity increase and this cream will help to fasten up the brightening process. Below is the image showing on the 1st day I am using the range and until 30 days. My skin problem is dry and dull skin. My skin can get flaky and dull when I am stress, lack of eating healthy food and using the wrong skin care. On the 1st day, my pores are pretty visible, my skin looks greyish too. After 30 days, I felt that my skin is smooth and more supple. 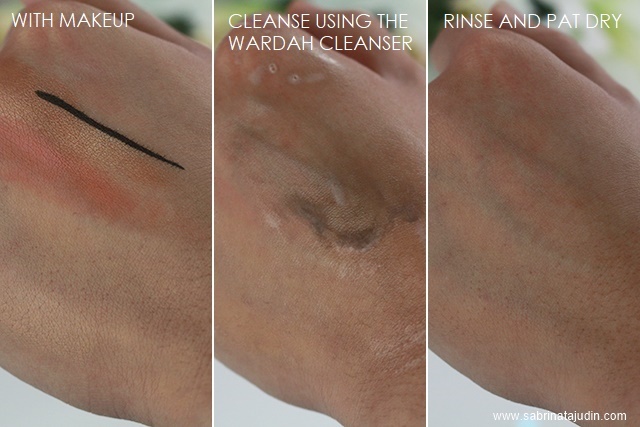 Wardah White Secret range is not like your typical whitening skin care product that has harsh chemical such as mercury. It promises to give you a brighter looking skin from within with proper usage as early as 30 days, which means, gives you a healthy skin and naturally gives your skin looking more radiant and crystal clear. It PROTECTS your skin from harmful UV Rays from the day cream. Sunburn or sun rays increase pigmentation of your skin. It MOISTURIZING with its Hydrating Agent from the Dual Action Hydrating Agent & Emollient. A balanced skin with perfect moisture helps with skin barrier. It helps to BRIGHTEN with its Anti Oxidants (helps to reduce ageing & pigmentation process), has Anti-Inflammation & Anti-irritation ingredients which is the Derma-Peptide (Biomimetic) Technology. This helps skin to be prevented from irritation that causes dark spot & skin redness. The whitening agent is the Crystal White Active (prevent melanin) & the Vitamin B3 (Inhibit skin melanin appearance on the skin surface). Natural AHA, to removes dead skin cells & Skin Transparency properties from the Silver Vine Extract to help skin looking glowy.